I’m one of the guests on this show and I come on the air about 55 minutes into the programme. 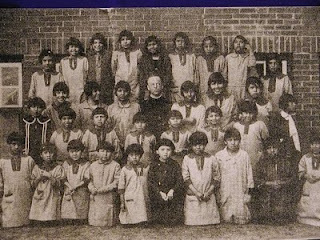 The reason I’m there is because I’ve no doubt that the Canadian Residential Schools Scandal is just one part of a global conspiracy of horror. As I explain in the interview, it’s the most important piece of activism we can do and when the whole story comes out it is going to blow our minds! It will be a scandal beyond scandal! There is no precedent! Hollie Greig might be one of the lucky ones, in that her story has been told. How many small voices are crying out with nobody to hear them? Why do the Illuminati this evil obsession with children? It could be because they represent the next generation. The reason they tried to take my daughter's fingerprints at school (http://hpanwo.blogspot.com/2007/08/biometrics-in-schools.html ) was not just to enter her onto an ID database, but to condition her into accepting big Brother procedures as normal. As Lenin said: "He who has the youth has the future." It could be more than that though; like many conspiracies this has a spiritual dimension. There are a rising number of children being born into the world who have become known as "Indigo". I'm not quite sure what this entails, but it's clear that Indigoes have a highly-devloped psychic and intuitive mind and could do a lot of good in the future when they grow up, as some of them have done like Jason Andrews; see: http://hpanwo.blogspot.com/2007/11/my-trip-to-haunted-house.html . The Powers-that-Be have always hated spiritual knowledge and evolution which is why they've exterminated indigenous cultures and gnostic sects like the Cathars. This was the true motive for the Inquisition and witch-burnings of the Middle Ages. However I'm happy to say that I think their efforts will be in vain. Thanks to people like Kevin, this dark secret is being exposed. People will weep in the streets all over the world when it does, but then we will be able to come to terms with it and the years hence will be happier and safer for our youngsters. I've added some more to the end of this article. I've just posted an important new HPANWO Voice story called "SlaveFare"
I've just added an addendum film to "The Sun is in the Wrong Place!"